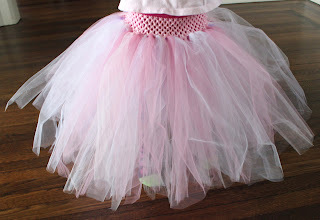 Again for this type of tutu I have used the same knotting method as you would make a No Sew Tulle Tutu - but instead of using any type of elastic or ribbon as a waist band you use crocheted elastic. 1) Cut and secure your waist band. I used 2 1/4 inch crocheted elastic cut from a spool for this project - but you can buy pre-made crochet headbands at most drug stores. This stuff is VERY stretchy - you need to make your waist band much smaller than you think e.g. I made my waist band about 6" smaller than I needed. I roughly tied the elastic together with a scrap piece of tulle before I started knotting. 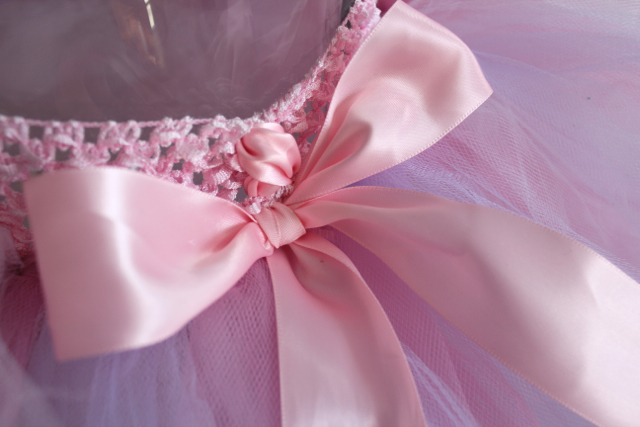 Once the tutu was finished I braided the join with satin ribbon and tied a bow. 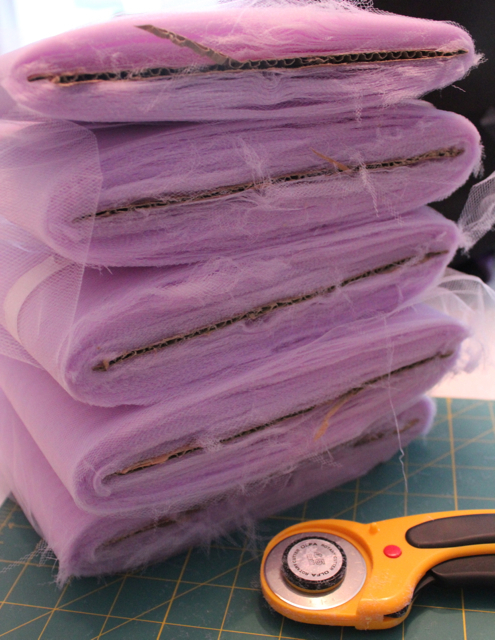 I chose to buy bolts of tulle and I cut them into 6 inch strips with my rotary cutter. This was much cheaper than using tulle ribbon on spools and it was very quick to cut it this way. You need to cut your strips twice as long as you want your tutu to be. I cut 26" strips for this tutu. Each round took approx 40+ strips. I knotted 2 rounds of tulle strips - so estimate you will need approx 55-60 yards of 6" tulle for this project. 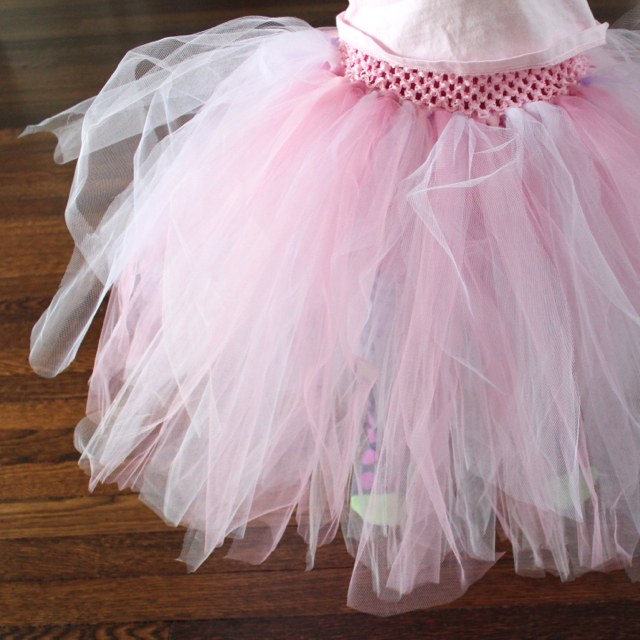 The finished tutu is extremely full. I have seen some tutu's made this way just using one round of knots - so this could be an option for you too. Wrap the elastic band around something big (I used a sofa cushion) and start knotting. I started to tie my knots into the second row of the crocheted elastic. 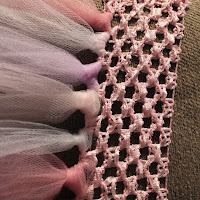 Use one strip of tulle for each knot. Continue tying knots until you have completed the first round. 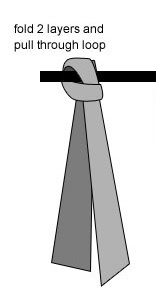 Start tying knots for your 2nd round - each knot will sit between the knots on the row below. I think 2 rounds of knotted tulle yields better results that just one round - you could do more rounds - but the fluffiness does get a little out of control! The more you separate the strips and tulle and fuss with the tulle - the fluffier your tutu will be. That is absolutely gorgeous Rachael! So clever! I wonder if I can talk Abby into wearing one - she probably will! 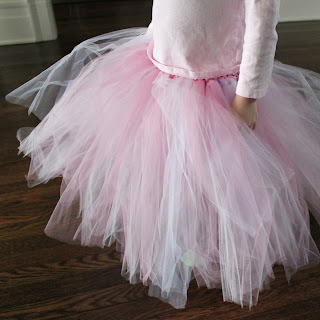 thanks for your great series on tutus. I am now following your adventures and I am amazed that you don't have a trillion followers. :) I am pinning your tutes and hope that it sends heaps of visitors your way. So cute!! So are you saying your waistband was only 2 1/4 inches long? Hi Leslie - the crochet elastic is 2 1/4 wide - you should measure your recipients waist and make the waist band about 6" smaller. I really hope this helps. Thank you so much for visiting Rachael Rabbit. Can you tell me where I can find the 2 1/4" elastic on a spool. I've been looking everywhere. Thank you! Have you experimented with different widths of tulle strips? 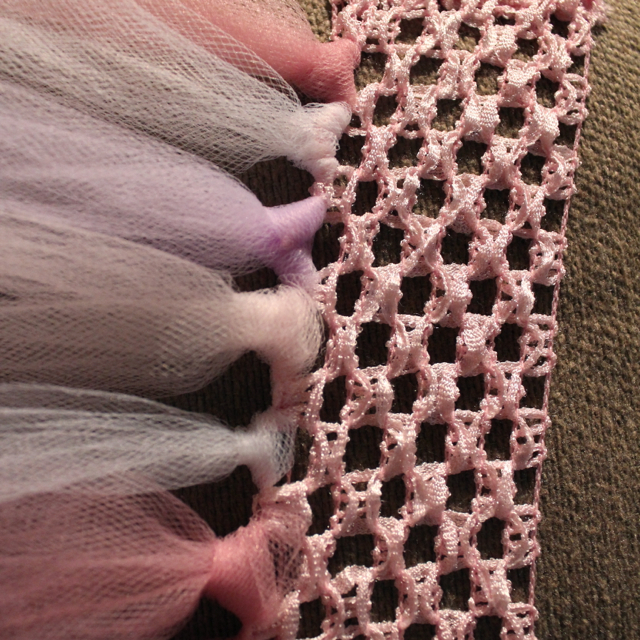 I'm very confused over whether to go with 4", 5" or 6", for making one with a crocheted waist band.